CRAZY DISCOUNT! Was: $209.95 Now: $119.96! 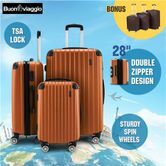 3-Piece Hard Shell Suitcase Trolley Set allows you to travel in style. The set includes a 20", 24" and 28 case with each piece equipped with a durable outer shell, adjustable top handle, a side handle and 4 smooth 360 degree swivel wheels. The super lightweight and large capacity of this luggage ensures you get the most of the allotted weight allowance. The interior is equipped with tie-down straps to secure clothing in place and a mesh pocket for toiletries; these suitcases make it easy to organize your belongings in a compact space. The protective corners and secure combination lock make this luggage trolley set a must have for savvy travelers! 44cm x 26 cm x 68cm approx. Good product good service from supplier.